Shreeji Tour & Travels is Uttar Pradesh leading travel agency. it provides information, pricing, availability, and booking facility for railway reservation, domestic and international flight ticket booking, hotel bookings, holiday & tour packages, buses, and car rentals. We offer a host of travel services designed to make business and leisure travel easier. 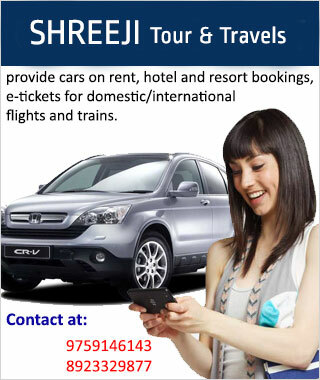 Shreeji Tour & Travels is a single destination for all travel-related services. A leading consolidator of travel products, we provides reservation facility for more than thousand's of hotels across India and around the world. Through continued excellence in providing travel solutions, responses to booking through us. we have also reached new heights with the our company. Customers can access our services on a single phone call, through our user-friendly environment, our countrywide network we provides booking facility for all the popular as well as exotic national and international destinations. We have core value differentiator is delivery of fastest and trusted user experience and takes pride in delivering these services at lowest prices in the market. We provide cheap air tickets, affordable budget hotels and smart deals on Indian and International holiday tour packages. Our comprehensive range of travel choices, competent pricing and call centre support empowers the customers to buy the most suitable products possible. we make a firm commitment to our customers i.e. to tailor our services to your specific needs, simplify the perception of travel and get you the best value for money deal in tune with your requirements. Our holiday packages are available across all parts of India, which ensures that the travellers explore the region.